Sometimes called white ants (although they are closer to cockroaches than to ants from entomologists’ point of view), termites are insects that could damage almost any object containing cellulose: wooden details, from structure of buildings to furniture, cardboard boxes, paper, art canvases, carpeting, etc. Termites are almost omnipresent: you can consider yourself completely safe only if you live in Antarctica and relatively safe if you live in a region with harsh climate like Alaska. There are 10 species of termites living in Europe, 50 species are found in North America, 400 in South America, and about 1,000 in Africa. The most common species found in homes is a subterranean termite. Termites live in colonies and prefer warm and moist conditions. So, the warmer and damper the climate is, the more likely you are to find these undesirable tenants in your home. At first, they are unnoticeable, but after a few years the signs of an infestation become obvious, which means the house is already seriously damaged. Apparent signs of their presence include a thin grayish-brown film on the surface of damaged objects, as well as narrow mud tubes on the walls and foundation of the house. These tubes are the termites’ paths from the colony, which is usually underground, to the sources of their food. Also, if you tap the wooden object and hear hollow sound, you are likely to have these pests. Once a year, usually in spring, termites swarm, after which they discard their wings. These wings look like fish scales and if you notice them along with dead termites, you had better contact pest inspector. Although carpenter ants don’t actually eat wood like termites, they build their nests in wooden parts of the house. If you notice small piles of wood-containing debris, it means that these creatures are somewhere nearby. Like termites, carpenter ants also prefer moist environments; they can live either indoors or outdoors in decaying or hollow trees. So, these insects are common in regions with forests. Carpenter ants rarely damage wooden furniture if it’s dry; instead, they settle in more humid places – under windows, in decks and porches, or roof eaves. Sometimes you can even hear rustling sounds near their nest. As for the food, ants gladly eat leftovers of human food, especially if it contains protein or sugar. Ants usually leave their nests to forage at night. 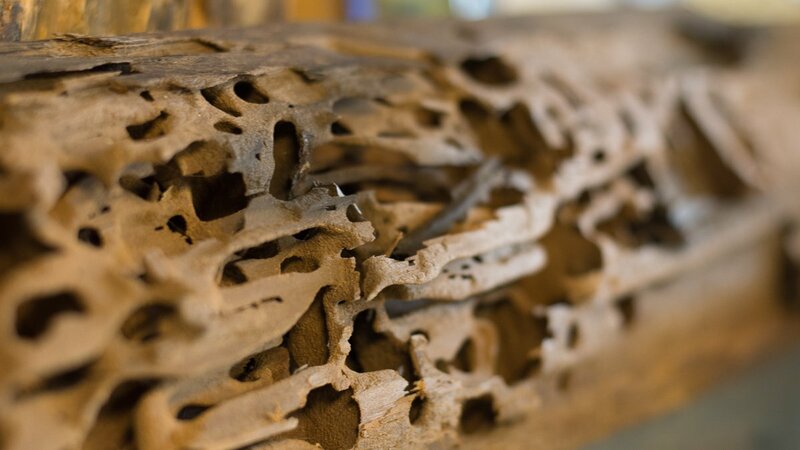 Tunnels that ants build inside timber may cause serious structural damage to buildings, if left undiscovered for a long time. The only way to avoid grave problems is to discover these pests in time and take action early. Carpenter bees also don’t eat wood – they feed on nectar and pollen – but build nests in wooden objects, choosing weathered, unpainted, and dry ones. Among their favorite woods are pine, cyprus, fir, redwood and oak. Round entrances to their nests are from 1 to 2 inches in size (about the diameter of a finger). There is a number of species of carpenter bees; all of them are solitary bees, which means that they live on their own. When building a nest for her offspring, a female carpenter bee excavates tunnels in wood and makes a few brood cells where it lays eggs. The bee prepares a ball of pollen and nectar for each prospective larva to feed on. Nests are likely to be found in doors, roof eaves, windowsills, untreated poles, fences, decks, and in wooden outdoor furniture. Carpenter bees rarely cause serious structural damage like carpenter ants or termites, but entry holes can spoil the looks of the wooden objects. Besides, female carpenter bees sting when disturbed (males don’t but they fly about and annoy people and pets). The name ‘Powderpost beetle’ doesn’t mean a single species: actually, it’s an umbrella term for seventy species of beetles of the same subfamily of insects called Lyctinae. Beetles lay their eggs into cracks and pores in wood. The larvae hatches and starts eating wood, turning it into a fine powder – that’s where the name “powderpost” comes from. These pests live almost everywhere, even in colder climates. Powderpost beetles can damage various objects that contain cellulose, including flooring, furniture, wooden handles, window or door frames, bamboo, structural timbers, and so on. If you notice powder-like debris as well as small pinhead-size holes in the wood, you might be having a problem. Powderpost beetles love old and untreated woods; in most cases, beetles appear in the home inside infested wooden products, e.g. furniture or paneling. If wood was stored outdoors for some time, it may also be infested with beetles, so using such wood indoors without treatment is risky. To prevent beetles from damaging wood, a range of wood preservatives is used, and structural fumigation is often necessary. If you live in an area where some species of wood-damaging species are common, you should be vigilant indeed. It would be really annoying to lose your favorite window frame, or set of Italian luxury furniture, or even the entire house due to these pests. In lots of areas it is reasonable to have a professional inspection of your home every few years. A specialist will spot minor signs of infestation that you are likely to miss.